Biblical Anthropology: The Nature of Human Beings and Human Life according to the Bible. I heard a sermon from a preacher who said something interesting. I found his sermon for the most part biblical until he said, "Jesus came to restore the image of God in man which was lost after the fall". From what I understand, the bible says not to murder because we are made in the image of God. This seems to indicate that were are still in the image of God and that this was not lost after the fall. The guy who said this was a very respected preacher, but as always I am careful to compare what is being taught to what the bible says. Is he correct in saying this? Could you clarify Isaiah 57:16? It seems as if what was being said here in the second sentence is: 'For man's spirit would faint away before me, even human spirits which I have made', with the 'spirit' being repeated twice. Is there any difference in meaning between the first and second 'spirit' in this sentence, or is the meaning identical? If so, is that a figure of speech used by Isaiah? And the Lord God formed the man (i.e., Adam's body) from the dust of the ground, then blew into his nostrils the life-giving breath (neshemah, i.e., his spirit), and [thus] the man became a living person. Regarding your argument about 'soul' (nephesh-psyche), I wanted to ask about the two passages you've put in the text of the study. "And do not fear those who can kill your body, but are not able to kill your self (psyche). But fear rather the One who is able to destroy both your self (psyche) and your body in hell." Since we are told not to fear those who can kill our bodies, but our 'self', is the self (psyche) used as a synonym of spirit? The second verse of that quotation also seems to suggest that self is a separate quantity to the body (otherwise it could be translated as 'destroy both your body and spirit and your body in hell - if we take soul here as a the entire person - body and spirit). On Matthew 10:28, yes, I do see your point about how psyche might be (and often is) taken here to be a separate and discrete part of the person instead of what it really is, namely, the whole person. Were this the only verse in the Bible which touched on these issues, and were the words pscyhe and pneuma not extremely common in Greek (both in secular Greek and also when used as counterparts of Hebrew nephesh and ruach), then I could see how this deduction might "stick". What I have a hard time fathoming is how much it has "stuck" in spite of all the evidence to the contrary. For to the contrary, and coming back to the principle that we are meant to be "complete persons" not "individuated parts", our Lord's argument has much more power if destruction applies to the entire person, "body and spirit". For in that case (i.e., the correct understanding of these matters) it flips the emphasis from "body" to "YOU in your entirety", rather than inviting the listeners to wander off in their minds thinking about the difference between a body and a "soul" somehow individuated. A Hebrew listener or a Greek listener of that time would most definitely in my view have understood the point in precisely the terms of the former rather than the latter, and that is what makes our Lord's point so emphatic: "Don't fear those who can only destroy your body; fear Him who can destroy the whole YOU (psyche), your body and your spirit (pneuma). Another question regarding the soul. You presented a clear argument for the two-element composition of human beings - body and spirit. Although, I must say that 1 Thessalonians 5:23, at least apparently (to a person with knowledge as limited as mine), makes it somewhat difficult to defend this argument. And in my view it's not as much the fact that these three are listed next to each other, but rather the order of that listing which is problematic. The list goes: A (spirit), A+B (soul) and B (body), whereas a listing of A, B and A+B would seem more natural when listing three quantities where one of the quantities combines other two. I would appreciate your explanation. And may the God of peace Himself sanctify you in every part, and, may your spirit, life (lit. "soul"), and body be preserved completely intact and without blame at the advent of our Lord Jesus Christ. 'in contrast to our present sinful flesh which is "soul-ish" (psychikos), that is, dominated in the soul or interface between spirit and flesh by the flesh'. Since 'soul' is the entire human being - body and spirit, why is this interface dominated by the 'flesh' (based on this passage)? Because the heart or "soul" of the unbeliever is still under the dominance of the sin nature since the Spirit is not present to provide a supernatural "bridge" between the heart/soul and the human spirit. In this chapter Paul deliberately uses psychikos ("soul-ish") to contrast with pneumatikos ("spiritual"). A psychikos or "soulish" person (i.e., an unbeliever) has no indwelling presence of the Holy Spirit to illuminate his/her own pneuma-spirit (that is why "spiritual matters" are "foolishness to him": 1Cor.2:14). The pneumatikos person has the Spirit and so can receive divine truth into his/her pneuma-spirit (see the discussion of Christian epistemology in BB 4B; see the link). So the term psychikos ("soul-ish") is for that reason often translated "natural man" while pneumatikos is often translated "spiritual man" – because the former is still in his/her natural state of having no link between the pneuma-spirit and the Pneuma of God, the Holy Spirit. Soul is more often referred to as the inner man and I understand it to be part of the link between the flesh and the spirit. However, I also understand it to be a component of the outer man, as the soul is the outcome of having received life through the spirit. In brief, I understand soul to be the most basic subtract of the human being, both of its outer and inner elements. In this sense and contrary to common understanding, I think the soul is more closely connected with the flesh, as it is often described in the bible as experiencing a wide array of desires, passions and emotions. It is also described as having the faculty to understand or have intelligence. I also understand the heart to be a component of the inner man, perhaps much more so than the soul, and it is often referred to in the bible as a component of wisdom as in "a wise heart", mind and intelligence, therefore it also has to do with understanding and knowledge, more so than the soul. Moreover, I also notice that in the bible, the heart experiences emotions such as gladness, sorrow, etc. Almost like the souls, but not as varied, or so I have understood. However, the heart has an element that I have never seen in the bible the soul does too, one that is essential to believe in the Lord. Conscience. In this sense, this is the reason why true faith must come from the heart and why the heart is what needs to be purified by the Holy Spirit. I also think the heart is in close relation with the will. A hard heart will chose evil, a purified heart will chose good. However, I sometimes think that the heart and soul are almost the same, except that the heart is more in connection with the spirit and the soul with the flesh and the link between the two is what establishes the bridge between the flesh and the spirit. Still, I am not sure. So, my question stems from the desire I have to know why the heart and the souls are explicitly mentioned separately in Deuteronomy 6:8. A curious thing I also notice is that lebab is a masculine noun, whereas nephesh is a feminine one, which leads me to think even more that both must be part of the same core as complements, yet distinct from each other. About my quotation, yes I totally agree with you and I shouldn't be drawing conclusions from things I really don't understand, like the true significance of masculine and feminine nouns in the Hebrew language. However, I think there must be one simply because grammar is the rules that define linguistic expression and language is essential to understanding. The proper use of our Lord's word requires equally appropriate understanding of its true rules and meanings and in that I'm very lacking and sadly the grammar (particularly semantics) of every language has been greatly corrupted, misused (I’m an offender at this!) and in this I find the reason for many misunderstandings. I guess that's why Paul advised to stay away from arguing the meaning of words, especially when it comes to such a profound and complex language as Hebrew. "The human spirit is more than just a life-force that animates the body; the human spirit is essentially "who we are". Our will and self-determination, our conscience, our understanding and mentality, our consciousness and self-consciousness are, while not independent of the body, essentially aspects of the particular, individual human spirit that is us. Below is a list of scripture passages touching on the human spirit in its facets, qualities and functions. Taken together, they paint a vivid picture of what the human spirit is in the Bible, namely our "inner person", the real "us". The spirit is the place of ... conscience .... reflection ... perception ... refreshment ... wisdom. .. willingness ... volition ... intellect ... personality ... mentality ... growth ... knowledge ... worship ... blessing." "The word "soul" is not the only biblical word that refers to the whole person, a combination of spirit and body into a living human being. The word "heart" (Hebrew: lebh, or lebhabh, ; Greek: kardia, καρδία) likewise refers to the human being as a unity, but with a special twist: scripture uses the term "heart" to refer to the whole person from an internal point of view, focusing on and encompassing all the facets of the inner life (e.g., mentality, volition, emotion, conscience, etc. ):"
Because the human spirit can be defiled as 2 Cor. 7:1 shows, it seems to me that when this happens (as a result of deceit, pride and other ill-born desires from the human spirit, not the flesh.) the heart begins to harden and it, therefore, becomes less sensible (or outright blind) to the origin and connection of the human spirit in and with the Spirit of the Lord. Moreover, in lack of such connection with the Spirit of the Lord, the human spirit begins to lose its strength or power to choose over the desires of the flesh and instead, it begins to be overpowered by the weaknesses of the flesh, its fears and needs. It also shifts its focus of attention; it becomes more concerned about the world, the material, than about the invisible, the spiritual. As a consequence the "heart's" ability to freely choose between the desires of the spirit and the flesh begins to become mired, it ceases to be truly free and it becomes more and more burdened by physical needs that often are wrongly satisfied when "seen" through the darkened and unwise eyes of a defiled spirit. Originally, the human spirit comes from the Lord (undefiled, of course, otherwise it would not come from Him) and is the element that gives true human life and the one that will continue onto eternal life linked to new, incorruptible and spiritual bodies once cleansed through the "heart" by the Holy Spirit. I say through the "heart" because the love of God is poured out within our "hearts" not in our spirits (Romans 5:5), to purify them (with the concomitant cleansing of the spirit, body and, consequently, soul) and its result should eventually be of "love from a pure heart and a good conscience and a faith without hypocrisy" (1 Tim 1:5) or, in other words, of true steadfast love, just like the one our Lord has for us. If not cleansed and kept defiled, the spirit will forever die by experiencing the second death. Now, it seems to me that the "soul" is the external link between spirit and flesh, as the skin is to the rest of our organs and as such it provides an appearance and somewhat identifiable image of every a human being in this world, this in terms of physical appearance and personality traits. Therefore, and as it has been translated, the soul is the person and a person, without the Holy Spirit that comes from truly believing, from the heart, in our Lord Christ and coming to know God, is more fleshly than spiritual. Because of this, in general I think that the soul tends to be somehow closer to the flesh, even if the soul is the whole summation of the parts (spirit and flesh) whereas the "heart" is the subtract or essence of both, and yet, I reiterate, it is closer to the spirit. Therefore, the soul or the self of a person can be comprised of many "apparent or outer" elements, such as when people have a "public persona" and of "genuine or inner" ones, such as when people have a different "private persona". On the other hand, this duplicity of the heart is more complex, although it usually is manifested in the deeds and thoughts of the soul. This duplicity, it seems to me, is product of following for both the desires, emotions, thoughts and weaknesses of the flesh, and the desires, thoughts and emotions of a defiled the spirit that may still be longing for what is good and whole either in "remembrance" of its once experienced connection with the Lord, or as a result of the initial and partial cleansing from the Holy Spirit. This duplicity can last for any given amount of time, for as long as we commit ourselves to both paths (the flesh under a defiled spirit or a cleansed spirit) by not committing to one of the both or end when we faithfully choose between one of them and commit to it. Hopefully it won’t be the one of the flesh and defiled spirit. Choosing the one of a cleansed spirit from a purified heart does not mean there won’t be stumbles, for indeed, the flesh is weak and has a hard time keeping up with a cleansed spirit, but this is a far cry from living in duplicity, because this in fact makes us hypocrytes and that is why we are warned of not being of a double mind, or soul, (James 1:8 and Psalm 119:113), but instead to "come near to God and He will come near to you. Wash your hands, you sinners, and purify your hearts, you double minded". The more we remain faithful to Him, knowing and living in His love, the more our "hearts" will become purified by His Spirit and as a consequence, the less and less will the flesh burden the choices in our hearts and the more we will live by the spirit and worship our Lord by the spirit, a cleansed spirit, a spirit that increases in conformity and identity to the Holy Spirit, this is, the Spirit of Christ. What magnificent freedom is at hand! The more we live under and a cleansed human spirit by the Holy Spirit, the less and less we will live under the law of sin and the inner conflict will be more and more resolved on the side of our Lord, on the side of holiness and true love, His love, leaving fear and weakness behind. As such, the following words by Paul from the epistle to the Romans will become truer in our beings; this is, in our souls. "14 For we know that the law is spiritual; but I am of the flesh, sold into slavery under sin. 15I do not understand my own actions. For I do not do what I want, but I do the very thing I hate. 16Now if I do what I do not want, I agree that the law is good. 17But in fact it is no longer I that do it, but sin that dwells within me. 18For I know that nothing good dwells within me, that is, in my flesh. I can will what is right, but I cannot do it. 19For I do not do the good I want, but the evil I do not want is what I do. 20Now if I do what I do not want, it is no longer I that do it, but sin that dwells within me. 21 So I find it to be a law that when I want to do what is good, evil lies close at hand. 22For I delight in the law of God in my inmost self, 23but I see in my members another law at war with the law of my mind, making me captive to the law of sin that dwells in my members.24Wretched man that I am! Who will rescue me from this body of death? 25Thanks be to God through Jesus Christ our Lord! So then, with my mind I am a slave to the law of God, but with my flesh I am a slave to the law of sin. It is sad to witness how many pastors use the previous words to somehow justify the continuous living according to the flesh, calling people who profess by their mouth to believe, "fleshly christians", when there is no such thing. A christian who lives according to the flesh is no Christian at all, or if s/he is, a very infant one who cannot remain so for long and as such, s/he should be called infant Christian and if called fleshly, this person should be very careful of what s/he truly believes. Anyway, Romans 8:1ff. provokes in me a doubt that I hope you can help me clarify, what element of the hardened "heart "and defiled human spirit, allows to seek the reconciliation with the Lord, our God? I think it is conscience and without a trace of it in our "heart" and spirit, we cannot ever seek the Lord with sincerity and true faith. After the spirit is defiled and the "heart" hardened, only conscience can help us come back to Him to then listen, understand and then grab a hold through faith that will eventually be enlivened by and in the love of God. A truly darkened spirit and diamond-hardened "heart" will never seek the Lord because all trace of conscience has died within. I say good-by for now. I cannot express enough my gratitude for your time and attention is assisting me understand and know better. May the Lord grant you patience and strength do His will under His light. Thanks for a very thoughtful and provocative email. You are clearly getting deep into this issue. I like your diagram very much and I think that it goes a long way towards explaining the ins and outs of this somewhat complicated topic. 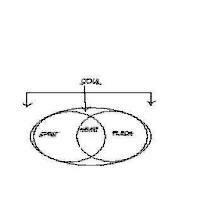 I would only wish to point out that sometimes "soul/nephesh/psyche" refers to the heart in particular, and that the "overlap" you chart is one of terminology only: the body and the spirit are discrete; the "heart/soul" represents their interaction. Of course all unbelievers have some degree of hardening when saved, and, yes, there is a point at which hardness eclipses any realistic possibility of repentance (the active rejection of Jesus Christ at which point the person's name is blotted out of the book of life being the clearest). For the discussion of these matters please see the link "Spiritual Rebirth" (also in BB 4B). Thanks too for your generous remarks! I trust you are well and in the grace of our wonderful LORD. I have been thoroughly enjoying your text, Satan's Rebellion and Fall! I have been so blessed by the series. In part 3, I love what you have to say about the soul - that it is not what we have been lead to believe, rather a misinterpretation. That has actually help me begin to resolve a few questions I have had around this topic. Now, that being said and knowing that the meaning of 'nephesh' in retrospect and 'psyche' have been somewhat skewed, how do you suggest we should best interpret passages like Deuteronomy 13:3 and Joshua 22:5 ... and Matthew 22:37? Thank you in advanced for any help you may offer. When our Lord says "heart/soul/strength/mind", He clearly is not so much differentiating between the four as He is using four synonyms to express the totality of the love we ought to have for God. Heart and soul are synonyms, and mind is a clear synonym for our inner-self as well. Strength is also a loose synonym for our inner man according to Hebrew usage (e.g., Ps.27:1). The traditional translations of these verses are not terrible – as long as one understands the true issues. Dr, Luginbill, one more question / concern, if I may... while I realize that much of this does not directly impact someone receiving the gift of salvation and experiencing eternity with our LORD and Savior (Yeshua), can it not influence the depth of our relationship with Christ and thus overall discipleship? And if so, in your opinion, why do we not see this more in 'church' and how do we get this to the 'masses' who may not know that they should know and/or may not be accustomed to reading extensively...? As always, I thank you for your time and guidance. May the peace and grace of our LORD and Savior, Jesus Christ, be with you. You are very welcome. To answer your question, let me put it this way. Peter describes the Church as composed of living stones being built up into a edifice, and Paul often speaks of the Church's edification, collectively and individually. Individually, we all "build" on the foundation of Christ, and the gold, silver and precious stones we produce stand the test of time and last forever (1Cor.3). But how exactly do we build? We laid the foundation by believing the truth of the gospel in placing our faith in the Rock, Jesus Christ – and believing and applying the truth is also exactly how we build on that precious foundation – for Jesus is the truth, very Word of God. A long way of saying that every scrap of truth in the Bible is important, and as we learn and believe it, it becomes an integral part of the structure of spiritual edification we are building in our hearts. Every brick left out is a problem for the structural integrity of the whole (as is every piece of straw or hay set in place of a brick – as if anything false could bear any load). No one is a perfect builder, but every genuine truth of scripture understood through the Spirit and believed so as to become one's own helps to explain and reinforce all the others and adds to the "critical mass" of spiritual growth which in turn brings maturity, informs, guides and supports our Christian walk, and empowers and directs the ministries the Spirit leads us into. Truth is the "sword of the Spirit" (Eph.6:17), the most precious gemstone that is worth all we possess, the one thing that the Lord has exalted "above all His Name" (Ps.138:2). Truth is irreplaceable, and is the foundation of all we do or hope to do in this life for our Lord. Why don't churches focus on the teaching of the truth as "job #1"? There are many reasons for this, one of which is that where there is little demand, there is usually little supply (most pastors who do focus on actual teaching usually end up getting fired by lukewarm congregations who are not interested and prefer "other things"). But there will be no excuse before the Lord on that great day of days. Any and all believers who really do decide they want to grow up in Jesus, walk more closely with Him day by day, and serve Him in whatever capacity He calls them to serve will very quickly have to decide to abandon much of what has become traditional in preference for what is good and true and spiritually beneficial. And God does "open" for whoever knocks; and God does provide the truth to be found for whoever genuinely seeks. I praise God for you that you are choosing "the better part" (Lk.10:42). Greetings in our LORD and Savior, Jesus Christ! Create in me a clean interconnection/interaction of my spirit and flesh/body/brain (heart), oh God, And renew a steadfast animating force for my flesh (spirit) within me. As always, thank you dearly for your time and feedback. OK - I believe I understand. And, I do love the learning process. I have so much to learn! That being said, your reference to the spirit being the "heart of hearts" - would that have any analogous relationship to the tabernacle and Holy of Holies? Is there a symbolic relationship between the architecture of the temple / tabernacle - holy of holies, holy, and court - and the spirit, heart and body. Thank you for your time. I can imagine how many emails you receive and how busy you are, so I cherish your responses and value your guidance. Blessings over you in the name of our LORD & Savior, Jesus Christ! You're very welcome. It's an interesting idea. There is of course much about the tabernacle/temple which is deliberately symbolic. In my view the holy of holies represents the third heaven, while the holy place represents the place of fellowship between God and mankind. One can only come into this place of fellowship by passing the brazen altar, representing the cross. As a result of our Lord's sacrifice, the curtain which divided the holy place from the holy of holies was miraculously split, demonstrating that there is now no barrier between God and man for all those who have been reconciled to Him through the blood of Christ. There is much more about all this at the following link: "The Jewish Tabernacle and its Symbolism". I have been reading (and re-reading) BB 3A. As I read about "life" beginning at "birth" rather than conception, I now logically have to ask how this statement fits into the abortion / pro life debate? Are you saying that an unborn child is not considered "alive" or living and therefore not a human "life"? This is not at all to imply that for this reason the fetus has no worth in God's eyes. Quite to the contrary, the unborn are highly valued in scripture (Ex.21:22; Job 10:8-12; Ps.139:13-16; Is.44:24; 49:4-5). Further we may note that in the Bible children are considered a great blessing (cf. 1Sam.2:1-11 and Lk.1:46-55), with infertility seen as a curse (Hos.9:14; cf. Gen.38; Lev.20:20-21; 1Sam.1:11), and pregnancy as a blessing and occasionally even a means of justification (cf. Num.5:11-31 and Lk.1:25). Whereas, on the other hand, the sacrifice of children is an abomination (Lev.18:21; Deut.12:31; 18:10; Ps.106:37-38). So in my view there is no debate. Abortion is as wrong as wrong can be. Life begins at birth with the implantation of the human spirit. Both of these things are true, and it is unnecessary to distort scripture in regard to the latter truth in order to support the former one. As in all matters, when things get political, truth is usually the first casualty. I trust you are blessed my friend. A very quick question for you about psyche / soul referring to the whole person. How would it be best to translate the second half of Matthew 10:28? And fear not them which kill the body (soma), but are not able to kill the soul (psyche): but rather fear him which is able to destroy both soul (psyche) and body (soma) in hell. Is this a case where it is being used more so as anima as you suggest it should be on p.24 of SR3 if I have my understanding correct (I know the Latin Vulgate says 'animam')...? Or is there another reason this passage refers to LORD being able to destroy both soul (body and spirit) [psyche - the whole person, living being (nephesh)] and body? Your insight and wisdom are deeply appreciated as always. May God's grace, peace and mercy shine on you continuously! "And fear not them who are able to destroy your visible outer person (i.e., the body), but are not able to destroy your invisible inner-person (i.e., the whole you inside: heart/psyche): but rather fear Him who is able to destroy your whole person (i.e., both your invisible inner and visible outer person) [by depositing you] in hell." Psyche/nephesh is often used instead of pneuma to represent the inner person because it is the totality of the "us" inside as we presently are, namely, our heart. This is the "place", for want of a better word, where spirit and body intersect and interact. Our heart is not yet pure inasmuch as we are still influenced by the sin nature. For that reason the spirit is at present to be distinguished from the body since the latter is corrupt but the former incorruptible (although in resurrection the new body and present spirit will be seamlessly interconnected with no further need to worry about the distinction as there will none, practically speaking). So the inner person of whom we are very aware is that person who is tempted and makes choices both for good and for ill. We are not really aware yet of our spirit apart from the influence of this corrupt body, making psyche/nephesh "soul/heart" a better choice for all such passages where the Lord is appealing to our free will as He is above. I found your site while searching for information regarding the Gap Theory . I am so grateful for this in-depth work. I have learned so much regarding this topic and broadened my understanding of the original creation and Lucifers rebellion. I plan on spending much time going over this information and all the other works you have done. James was writing this letter to believers and not to unsaved folks. I am in no way dishonoring you or looking for an argument. I have the utmost respect for you and your hard work and study. Thank you so much for your diligence in compiling this great material. My eyes have been truly enlightened and my understanding deepened from these articles you have allowed me to read. Good to make your acquaintance, and thanks for your good words. On the trichotomy/dichotomy issue, it really is a very important one – more important than many Christians realize – because it affects everything from the nature of who we are, to how we are saved and what happens at salvation, and what we shall be in eternity. I think you have presented the trichotomous position about as effectively as it can be presented. To me, this is evidence for my position. I think if you read over your own defense carefully you will see the essential problem with the position overall, namely, that it cannot make sense of the biblical evidence and put everything together in a completely coherent way. I am certainly not faulting you in this regard (especially inasmuch as you are believing what you were taught), but in my experience and observation this is a very important "tell" when it comes to all things theological. For those of us who are really seeking after the truth, we are never satisfied until every piece of the scriptural puzzle fits into place perfectly, and we are not about to let those things which disturb us because they don't seem to fit be swept under the rug. From your positive attitude and clear thirst for the truth I rather suspect that this is why you brought up this particular point, namely, out of a desire to get to the bottom of things. I certainly respect and appreciate that. Every human being who is honest with him/herself understands that we are more than just a physical body: we are also very clearly an "inner person" with a mind and a conscience and a memory and, most importantly an ability to choose. There is the outer "us" but there is also the inner "us". We may call the inner us the heart, or the soul, or the spirit, or the mind, but whatever we decide to call it there is very clearly only one inner us, not two. That universally accepted reality makes drawing a distinction between a soul and a spirit a very heavy lift for those who feel that scripture teaches two discrete immaterial parts of the human being. Even in the case of those of us who are born again, while we do have a "new heart", we do not have two of them. I have certainly heard before the proposition that the spirit is introduced at the point of the new birth, but apart from not solving the previous problem it also introduces even more intractable theological problems: if the spirit is the part that can commune with God, how can unbelievers be saved? Wouldn't they have to have a spirit to understand the gospel? To whom does the Spirit communicate? If to the soul, then the soul is the part that makes the decisions, not the spirit. So in that hypothetical case (of receiving a spirit at the new birth) we are really our soul (not our spirit which we didn't have before salvation), and it would then be the soul that does the choosing – so what does the spirit we receive later do? Certainly, both parts can't have free will, can they? Moreover, in this hypothetical case human beings would then be entirely generated by natural procreation until the new birth. But doesn't God give life? And unsaved human beings would be different from all other creatures because even animals have spirits (Eccl.3:21; cf. Ps.104:30). More than that, how could it be that all are written in the book of life and only blotted out after failing to believe if unbelievers never receive a spirit in the first place (see the link)? Blessedly, scripture does not address any of these intractable theoretical questions because they are not germane, the theory being incorrect. As we all are aware from our common experience, we all know about God and we all have the power to choose from birth. Much changes at the new birth, but not the essentials of who we are. We were lost, and now we are found . . . but we are still and always have been "us". On the James 1:21 quote, the Amplified Bible uses the word "spirit" but the Greek only has "with humility" (I don't know of any other versions which use "spirit" here either). Additionally, the phrase "saving of the soul" is a very common one in the Bible, but it would be rather odd if it were meant in the way trichotomists take it. After all, we are a unified person, however we want to understand that person, and we certainly do not expect that only our soul will be saved with our spirit and body left out. We are resurrected in bodily fashion and as single, unified person, after all, and indeed from the point of our birth onward will never lack a covering for our inner man (see the link). Why then "save our souls"? This does make perfect sense, however, if we understand the word soul as meaning "living person" – exactly as it does in Genesis 2:7: "And the LORD God formed man [of] the dust of the ground, and breathed into his nostrils the breath of life; and man became a living soul" (KJV). Notice, not "received a soul" but "became a living soul". Soul = person. The "soul" is thus not a separate or discrete part of the human makeup and not a single scripture says that it is. Indeed, just from these two passages we can see that it cannot be such. If only our souls were saved, then what of our bodies or spirits? If we become "living souls" when God breaths in the spirit of life, how could we be said to have something we are? The problem, as I have often had occasion to explain, comes from English. Were it not for the fact that the word commonly chosen to translate nephesh (Heb.) / psyche (Gr.) in the early versions of the English Bible was "soul", there probably would not be such confusion on this issue today. But the error, of course, is ancient, and really goes back to the Latin versions of the Bible which sought to match Latin usage (in the words anima and animus) with the Hebrew/Greek scriptures. Once animus was linked to nephesh-psyche the problems began, because this practice foisted the pagan Roman conception of human psychology on the Bible, and it has been difficult for those without access to the original languages (or who pay too little heed to them) to escape this negative gravity ever since. Thanks again for you enthusiasm for the Word of God and for your reasonable spirit (the mark of a truly good "soul/person"). Thank you so much for your response. I appreciate the fact that you would take the time to engage my email. First I would like to say that you are far more understanding than me regarding the scriptures. I would not begin to try and debate with you on any level. I always want to position myself as a student. After rereading my original email, I see that I fell way short of what I was trying to say. This is not an attempt to convince you in any way, just my understanding of what I believe. I was not saying that man receives his spirit when he is born again. We are spirit beings. I was saying that when we are born again or born from above or born of God (However we say it) our human spirit is awakened and Eternal life is imparted to us (Romans 6:23). No man can come to God unless the father draws him. It is by the preaching of the gospel that men are saved for it is the power of God unto salvation. That is how unsaved folks come to God. They are a spirit just like you and I. They just have a spirit that is not in tune to God. When Adam fell in the garden, his human spirit died and was separated from God. His body and soul were corrupted by the sin nature. He was aware of evil and guilt and shame. He began to operate from this corrupted status. His fallen body and soul dictating to him instead of the spirit that God put in him and energized with his own (God's Spirit). When we are born again this dead human spirit we inherited from the fall is awakened by Gods Spirit. We are new creatures in Christ, a new species of being. All things are of God. I believe our new born again spirits are perfect when we are born again. With that said, our bodies and our souls are still the same. We still look the same, act the same and think the same. That is why Paul, speaking to born again believers said not to be conformed to this world but to be transformed by the renewing of our minds. Is he saying we have to renew our born again spirits? This does not make any sense to me. What was Paul saying if he said I will pray in the Spirit and I will pray in the understanding? Paul talked about being renewed in the spirit of our minds. Putting off the old man, the old corrupt nature that still lives in our un-renewed mind. He said to put on the NEW man which was created according to God in true righteousness and holiness when we were translated from darkness into light. In other words, when we were born again we received a new nature. In order to walk in the new man we must renew our thinking to think like God thinks. We must hold fast to the confession or profession of our faith. Confession is to say the same thing God says. We must line ourselves up in our soulish realm to think like God. Our flesh is always at war with who we are recreated to be. The spirit is willing but our flesh (un-renewed mind or our soul) is weak through all the junk that was programed in inherently by the fall and all the other things we did before being born again. I just cant see our spirits needing any re-newing or having anything missing or broken. The word of God can separate soul and spirit and the thought and intents of the heart. If they can be divided they are separate. The soul of man contacts the mental side of this physical world that we live in and the spirit communes with God as he is Spirit. We can't communicate with God via our minds. God is not a mind he is a Spirit. I believe when we pray out of our spirit, inspiration from God springs up and causes our minds to be fruitful. I realize I can not teach you anything nor am I trying to. I'm just trying to show you why I see things the way I do. You are a great man and I respect your study of the scriptures. I only wish I had what you do in regards to the ability to study and retain information. I will continue to read over your material and I know I will gain much understanding as I already have. Good to hear from – and rest assured that I certainly did not take any offense from your first email (nor from this one either, for that matter). And I certainly appreciate your good attitude. As to what you say below, I apologize for misconstruing your position on the spirit and am glad to hear that it is much closer to mine than I had supposed. As I read over your text, I don't see much to disagree with – except for the part of the soul being a separate part and the spirit dying and coming to life. I think you are very close to the truth (closer than the vast majority of systematic theologies are on this issue), and have clearly given it quite a lot of thought. Yes, we are spirits – in bodies. And that sums it up in my understanding of scripture. The "soul" is the whole person, and as I explained last time there are virtually no passages of scripture where the word "soul" occurs in an English translation where the words "heart / self / person" cannot be substituted. E.g., Gen. 2:7: "Adam became a living soul" KJV / "Adam became a living person" NLT. Consider: if the soul were a separate and discernible part of our essential human makeup, the word itself in Hebrew and Greek could not be used with such a wide variety of meaning. If Adam had a soul, how could he be said to "become a soul"? Our souls are saved, but that only makes sense if our souls are us (the whole person) rather than a part of us which does not include the body and the spirit. The quickest way to get to the bottom of theoretical discussions of this sort is to go to the scriptures. If our theory is correct, scripture will bear it out. If it has problems, scripture will soon make these apparent. The passage above to which you refer makes this point. Paul's object here is to show that the Word is so penetrating that it is capable of dividing that which is inseparable. Joints and marrow are not easily separable, the one being a definite and discernible part of the body, the other being a substance present throughout the skeletal system, the two being inseparable for all practical purposes to the medical technology of that time. By chiasmus (clear from the meaning of spirit), the word joints (discernible) is parallel to spirit, while marrow (less so) is parallel to soul – and we know that this must be the case since the spirit is always the spirit, a discrete and distinctive part (whereas the soul may be the person, the heart, the self, the inner man, etc.). So this passage actually shows that, like joints and marrow, soul and spirit are inseparable for all practical purposes – which entirely makes sense if the soul is the heart, the place where the spiritual and bodily mind come together. The mind or heart or brain is part of the body, and to the extent that "soul" is being used to describe the whole inner person as opposed to the person as a whole it definitely includes the body/brain/mind. The "soul", in terms of that word's usage as a descriptor of the inner person, is the interface between spirit and body, the place where they come together. It is there in the soul/heart that we fight the fight against the influences of the sin-infected brain/body with our spirit which has been redirected to God and His truth. In a word, I think you are viewing this all in essentially the correct way when you say "I just can't see our spirits needing any re-newing or having anything missing or broken". I entirely agree. The spirit is perfect. Only the body is corrupt. The difference between the pre and post salvation condition is one of orientation (please see the link: "Our New Orientation as Reborn Believers" in BB 4B). The spirit of the "soulish man" is oriented to the sinful body; The spirit of the "spiritual man" is oriented to the Holy Spirit. Two men passing each other on a bridge are at the moment of passing at precisely the same point – but the direction in which they are going makes all the difference. The unbeliever who believes turns around, fundamentally shifting his direction and also his allegiance. There are many benefits and transformations accompanying salvation, but the spirit is the same, perfect and not corrupt, coming directly from the creative hand of God at birth. It is the body with its fleshly mind/brain which is corrupt – and that will not change until the resurrection. So we are very much "new creatures" at salvation, but that new creation is the transformation from death to life through God's fundamental reorienting of us when we believe. This reorientation is all about the truth – and our response to it. It begins with the truth of the gospel which we accept and believe, and are then given (positional) eternal life (Rom.6:23). We then continue to reorient to God's truth throughout our physical lives (or at least we should) as we retrain our hearts/minds/souls with that all facets of God's truth as we believe it. The unbeliever is just like us in his/her essential makeup – except for the critical fact that he/she is unwilling to accept the truth and so remains "turned the wrong way". Until he/she responds positively to the gospel and turns around, no progress towards the good is possible and all of God's truth remains "foolishness to him" (1Cor.2:14). For me, this is a very important point because the fundamental principle in the Plan of God is choice. God the Father has made salvation available for all by having His Son our dear Lord Jesus die for all sin. The only thing lacking is the will to be saved on the part of the lost. That is why I brought up the book of life last time. God wants all to be saved and all are capable of being saved and are actually in the book of life – until they reject Christ outright (or die without accepting Him). But if our spirits were dead, it seems that the situation would be exactly the reverse and our salvation would then be dependent upon God's prior awakening of our spirits without our acceptance first of His truth (which can only be spiritually discerned). As a result of Adam's fall, all human beings are "dead at birth" – spiritually dead to God; but all are made alive through faith in Christ – granted eternal life by God, being considered by Him now not dead but alive (please see the link: "What it means to be saved" in BB 4B). As I say, this is the gist of it, and the previously provided links have much more in the way of detail in the explication of these important matters. I am happy to discuss these (and any passages you would wish to consider). I recently came across your site, and I"m learning alot! It's absolutely wonderful to find your teachings online, I appreciate it so much. I'm just getting started and have a lot of your material to cover, so please forgive me if this question is covered in other sections of your teaching because I haven't found the answer yet. My question is this: Do we have a pre-human existence in heaven? PS. As a side note, do you know Kat Kerr? She was taken to heaven many times and she saw the whole thing about the first age with the dino's and how God caused it to become dark and frozen because the earth was corrupted by satan. Then He blew on the earth and defrosted it, then He let the light shine and rebuilt the earth. I can send you a link if you wanted to look at it, or you can get her book Revealing Heaven 2 by Katt Kerr, she explains it all in her book. Really interesting because when I read it on your site I remembered it written in her book too. Very good to make your acquaintance – and thank you so much for your enthusiastic interest in this ministry! In BB 3A: "The Creation of Man"
As to the book you reference, as it says in scripture "[even] if we receive the witness of men, the witness of God is greater " (1Jn.5:9 KJV). In other words: "In God we trust: all other pay cash". Christians have a tendency to believe what other Christians tell them, even when what is being told is pretty "remarkable" (please see the link: "Christians need to believe the Bible rather than third party reports"), but our Lord told us to be harmless as doves, yet shrewd as serpents when it comes to the clever deceitfulness of the devil and his servants (Matt.10:16; cf. Rom.16:19; 1Cor.14:20). The litmus test for all such claims is "does it agree with what I can find in the Bible?" Whatever does can be believed without much potential harm; but if there is anything that a) is not found in scripture, or b) contradicts scripture, then it is a case of "by their fruits you shall know them" (Matt.7:16; 7:20). I don't know this person and have not read the book, but I find the whole idea antithetical to what has ever happened, even in the case of history's greatest prophets. One thing that many interpreters miss, even those who are correct about the Genesis Gap (see the links: "The Genesis Gap" and "The Genesis Gap: Questions and Answers"), is that the earth was not just frozen in the Lord's judgment of the world after Satan's fall – the entire universe was inundated with the tehom, the universal "deep" (Gen.1:2; 1:7). If anyone was given to "see" those pre-historic events, I should think that would have been very obvious and hard to miss from a visual perspective, even if it is often missed when reading Genesis chapter one (on this point, see the link: "The Water Above, the Firmament, and the Genesis gap"). This error in the book you mention leaves me therefore very skeptical of the whole. Another good "tell" for veracity of any claim (biblical or secular) is the question of whether or not the person making the claim stands to make money in some way (e.g., from the sale of books). After all, the desire for money is at the root of all sorts of evils (1Tim.6:10). I recently came across your online series about Satan's Rebellion . It was an answer to prayer for me. Thanks. . It is excellent. I have a question that is probably pretty minor, but it comes to mind to ask. My question is about spirit, soul and body. I'm not sure I understand what you are writing about. My understanding is that spirit , soul and body are distinct parts [ although interrelated] of man. Is the following pretty much in line with what you've written? God blew the breath of life [ spirit ] into the dust [ Adam] and he became a living soul ........ [ just like electricity [ spirit] moving through a coil [ dust ] produces something new...a magnetic field [ a soul].. Sometimes when I read the Bible or a commentary on God like your work, it's pretty dry because just my soul is involved [ my human nature mind]. But then His Spirit shows up and makes it alive to me, which enlivens my spirit and my soul . Is what I just wrote basically the same thing as you presented? This is a question I get quite a lot, and it is an important one. I think your example of the magnetic field is a very good one. In that analogy the coil is real and material (corresponding to the body); the electricity is real but unseen (corresponding to the spirit); the effect of injecting the electricity into the coil produces something dynamic, a magnetic field (corresponding to human life). In one of the key verses on this, which you quote, namely, Genesis 2:7, the result of the Lord breathing the spirit (as in electricity) into the body (as in a coil) is that "the man became a 'living soul' " (KJV). Notice, Adam did not "get a soul", rather "he became a 'soul' ". Hence the problem with translating nephesh as soul (similar problems with the Greek equivalent psyche as well in the New Testament). NIV is better: he "became a 'living being' ", and that really is what the Hebrew and Greek words nephesh and psyche respectively mean. We become alive as the result of God's placing of a spirit into us at birth; without God's putting in of the spirit, there would be no life at all. So the magnetic field analogy to be valid would have to be understood as the proof or manifestation that there really is electricity in the coil: it has been electrified in the same way that the human body has been enlivened by the introduction of the human spirit. The more common (and incorrect) view of this important matter, sometimes called "trichotomy", is to understand the "soul" as a tertium quid (see the link: "Is the Soul a tertium quid? "), or a separate entity with an independent existence. My biggest problem with the coil analogy would be that the magnetic field is to some degree something separate from the electricity and the coil – and that is how we think of the English word "soul" – but that would be an incorrect way to understand what the Bible actually says about nephesh and psyche: "Adam became a living nephesh" = a living person. Wherever these words occur in the Bible, substituting "person" or "self" or "heart (i.e., the inner-person)" will yield a good sense. So if someone is using "soul" in the sense of "not a soul was present", that is fine (as also in "he's a good soul"; cf. "he's a real Mensch"). But to the extent that the "soul" is understood as being a separate entity in any way, that is a confusion of what the scriptures actually say. It may not seem important – although Bible believing Christians who are really seeking Jesus find out pretty quickly that everything in scripture is incredibly important even if its particular importance is not immediately obvious – but it really is. Failure to see that the spirit is the only truly immaterial part of the human being leads to doctrinal error in the issue of when life begins, what eternal life consists of, and even how we are saved (depending upon the group we are talking about). A good way to think about this is to substitute the word "heart" any place in scripture that seems from an English translation that the word "soul" may be talking about some separate entity. For we should understand that our "heart" is the innermost place of our entire person, body and spirit, the place where we feel and think and consider – and on account of our sin nature are tempted, et al. To the extent that there is anything like a "soul", that is what it is: the interface of spirit and body inside of us, our inner-life, our inner-person, our "living self" on the inside. Scripture uses nephesh and psyche to refer to the whole person whether viewed from the outside (e.g., OT-nephesh: Gen.46:26; NT-psyche: Acts 7:14) or the inside (e.g., OT-nephesh: Gen.34:3; NT-psyche: 2Cor.1:23), but never to a entity of the person distinguishable from the other (true) parts of body and spirit. The essence of this problem stems from the English language and Roman Catholicism. The English word "soul" does refer etymologically to an independent spiritual entity – and as such was a poor translation for nephesh and psyche in the first place. And Roman Catholic doctrine is trichotomous (and very confused) on this issue, and has handed down its false, confused beliefs to the rest of us (the Reformers did not have the time and energy to fix everything, as their complete overlooking of eschatology also attests). But there is no excuse for Bible-believing Christians today, with all of our resources for studying scripture, to fail to get to the truth of this very important doctrine (traditionalism and English usage being the main stumbling blocks whenever true, biblical dichotomy is not accepted). As is often the case, merely working one's way through a concordance and looking at all the passages will make it clear enough for anyone genuinely seeking the truth. Soul as a synonym for heart. Thanks for your kind words and comments. Please do write me back about any of the above. You're probably right. I read some of the related links but not all of it is lining up for me yet. My understanding is that "leaped" [ the brefos in Elizabeth's womb leaped ] is an active verb. The brefos [ the noun in the sentence ] did the leaping [ active verb ]...when Elizabeth heard the sound of Mary's voice . Is that correct according to the language? If so........if that is true, and there was no spirit there yet, [ only the body of what would become the living soul , John the Baptist, ...then the body, yet without consciousness, had some kind of "knee-jerk" response [ for lack of a better term] at the sound of Mary's voice ? Something of a spirit nature [ not his spirit ] caused the body to leap with joy ? Some kind of automatic reaction ? [ even the stones would cry out ] [ A human body is designed to respond to spirit.] ? If the babe didn't leap for joy [ according to the grammar] then all bets are off! I just came across your article about " did the babe leap for joy...or did he "...after I sent the previous email. I see that Luke writes " The babe leaped in her womb " [ verse 41 ] ie.. It wasn't Elizabeth telling Mary about it in verse 44. I'm new to this, but doesn't that mean that we are to ascribe that to the Holy Spirit's influence on Luke. ie ..the Holy Spirit telling us that the babe lept in her womb rather than the uncertainty of a person's [Elizabeth's] testimony that is recorded in scripture [ re your article]? Re my earlier email. I'm not suggesting that it's evidence for life before birth... just reading the scriptures. As to your question, we must certainly take everything scripture says very seriously. Part of that process is figuring out precisely what the Bible actually does say. I do understand your point. However, putting ourselves into the situation you ask about, namely, Elizabeth's conversation with Mary, it is clear that a fetus could not hear a conversation and react to it in the same way a child of, say, seven or eight might do – certainly not to the point of recognizing Mary's voice! Happily, this is not what scripture says. In verse 44 Elizabeth says "As soon as the sound of your greeting reached my ears, the baby in my womb leaped for joy" (NIV). This is completely consistent with verse 41: "When Elizabeth heard Mary's greeting, the baby leaped in her womb, and Elizabeth was filled with the Holy Spirit". The baby in her womb is never assigned hearing. Elizabeth is the one who does the hearing. And so the joy in verse 44 is Elizabeth's joy. For how can anyone react to aural stimuli without hearing – particularly when in this case it is connected absolutely to the nature of the person heard. It is, however, a frequent and well-known occurrence for a fetus to react in response to its mother's emotional or physical states. Further, we are told in that same verse that it was Elizabeth who was filled with the Spirit, not the baby. And yet we were told earlier in the chapter in verse 15 that John would be "filled with Spirit even from birth". So scripture certainly seems to making the point with this comment that birth is the point when everything begins – otherwise, shouldn't John have been filled with the Spirit from conception? That inconsistency (for those who see spirit-life in the womb) is no doubt behind attempts to incorrectly re-translate verse 15 to mean "while in the womb" (as in the manner of the NLT translation – but the Greek does not support that attempt). In actuality, therefore, since it is Elizabeth who hears and Elizabeth who is filled with the Spirit, and since everywhere else in scripture human life begins at birth, I think we are very solid ground to understand the joy as her joy, and the physical reaction of the fetus as part of her emotional reaction. I have no problem with seeing this as prophetic and as significant. I do have a problem with using it as "evidence" of independent life in the womb. Adam had a perfect and perfectly formed body before he came to be truly alive (in the sense of being a person with a spirit); only after the Lord breathed the "breath of life" (i.e., the human spirit) into him did he become "a living person". So when does God do this? Only when the person is born and draws breath. That is why scripture emphasizes birth. Otherwise we would have to understand John as having a human spirit in the womb (received when? at conception? ), being able to hear Mary's words himself (how? through being hooked up to Elizabeth's ears somehow? enough so to recognize Mary's voice? ), being able to process those sounds and connect them with Mary, a person he had obviously never met before (!) or even heard before, feeling joy at the recognition that this was Jesus' mother to be, and then reacting appropriately by "jumping with joy". If scripture taught these things we would accept them completely, but as it is none of them is biblical – and none of them makes the least bit of sense. After being out of the womb, filled with the Spirit, grown up and adult, and many months at least into his ministry of proclaiming the Messiah, John did not immediately recognize His cousin the Messiah, our Lord Jesus (no doubt not having seen Him before – Jesus grew up in Nazareth, not Bethlehem). And he says here that but for the sign of the Spirit he would not have recognized him at all. If that is the case (which it is clearly stated to be), it is hard to see how as a fetus without the Spirit he heard Mary's voice even from within the womb and not only recognized it (even though he had never heard it before) but also reacted to it positively, even though he had not yet been born (and according to other scriptures would not yet even have had a human spirit, without which thinking is impossible). As I say, if scripture taught this, we would accept it. But that is certainly not my reading of what the Greek text must mean here at all. Given the imponderable difficulties with accepting this line of thought, coupled with the many contradictions it would generate with the otherwise seamless picture provided by all the rest of scripture about when and how life begins (see the links provided last time), I will stick with the interpretation in the link you mention ("John leapt for joy – or did he?"). Here is another link where these issues are discussed at some length: "Life Begins at Birth". Thank you for continued interest in this ministry and in the truth of the Word of God. May our Lord lead us all to a complete and perfect understanding of all of His truth in the most direct and rapid possible way. I was glad to stumble across you article about when life begins. I came to this same conclusion 20 years ago while doing a study on the "nature of man" in bible school. I thought I was the only person in the world that thought that way. I don't know Hebrew. Exodus 21:22-23 seems to support the view that the mother's life is somehow more valuable than the miscarried child. Does the Hebrew support this or is this a place that is just to obscure to make any conclusions? Thanks for any help on this. Good to make your acquaintance. There are a number of things we can garner from Exodus 21:22-23. The text is concerned with the woman first and foremost. If she does not sustain serious injury to her own person, then there are no criminal grounds for process against the one who inadvertently caused her to miscarry. There are, however, damages due "as her husband shall determine". What I think we can get from this passage is that the unborn child is very important: even though the woman's own person was not harmed, nevertheless a fine is imposed. Later on in the chapter, the punishment for allowing an ox which has gored anyone in the past to run free if it gores again is death (Ex.21:29); however, if a ransom is demanded in place of the death penalty, then the responsible party must pay. Additionally, however, if the person gored is a slave, then instead of the death penalty or unlimited ransom, there is a fixed fine of thirty shekels of silver (Ex.21:32). Exodus 21:23ff. says that in case of "serious injury" in general the compensation is to be proportional, "an eye for an eye" and "a life for a life". It is also important to note where the "an eye for an eye" command is repeated (at Deut.19:21) that the context is one of dissuading false witnesses from lying – because they will then be assessed the penalty for the crime they lied about when discovered. So I suppose it could be argued that since no life is demanded in the case of a miscarriage, there was "no life lost". However, it is also true that there is "life lost" in the case of the gored slaves, yet a financial penalty is fixed and no "life" demanded for the life of a slave. Or I suppose it might be argued that there is life in the case of the miscarriage, just not life as important as the life of a free, independent person. In fact, however, I don't think any of these other conclusions are justified from the chapter. The passage shows that the unborn child is to be considered valuable. The penalty, I think, has more to do with the circumstances than anything else. After all, in the hypothetical case, there seems to be no intent to harm the woman in question, let alone her unborn child. So that even if it were a case of a child in her arms this may well be considered an instance of manslaughter rather than murder for which, even though it is the taking of a life, was not punished with death (cf. Num.35:11). In my view of what the Bible says about these things, "life" begins when God places the human spirit in a person at birth – perhaps not dependent biological life, but certainly independent spiritual life. The child in the womb is, however, very much valued and anticipated throughout the scriptures. Personally, I don't find anything inconsistent in these two things. It is perhaps a sign of the times that we live in that instead of society as a whole appreciating that life begins at birth and yet valuing the promise of life about to come while still in the womb, so many are so willing to treat this incipient life-to-come as valueless, and so many others are willing, for political reasons, to elevate it contrary to scripture into something it has not yet become.